My Summer, this year, was kind of an hard one. I was indeed occupied by my bachelor thesis which consisted in the automation of an astronomical observatory in the Southern Switzerland. The observatory is owned by an association of amateur astronomers called "LePleiadi". The biggest challenge of this project is tied to the observatory location (at 1600 meters, quite unreachable during winter) therefore the observatory has to take care of himself alone, especially in the winter season. One important feature of this solution is that every possible alarms that happens are signaled by the PLC via email (and maybe later by SMS). For most common alarms (like sky becoming cloudy) the PLC take care of it by himself. There is anyway some situation where the human action (remote or in extreme case in place) is needed. 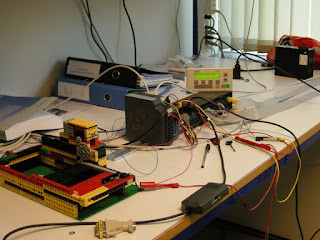 The electronics of the observatory has been completely reviewed and a lot of sensors were added. 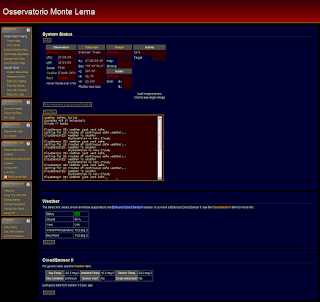 To stay safe the observatory has to know every possible threats to him. 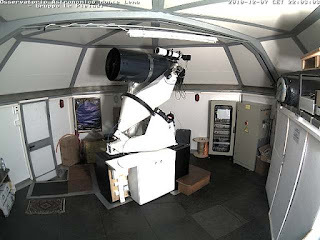 (weather, snow, sky clouds, telescope dangerous positions, ....). 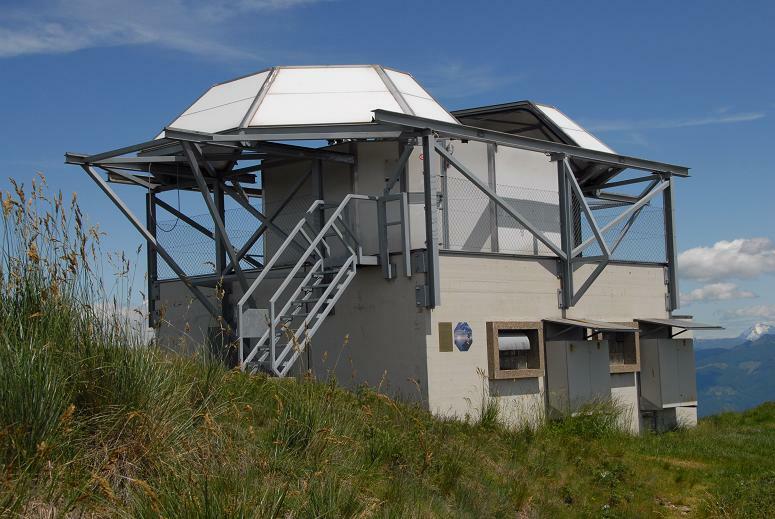 A radio bridge grants the Internet connectivity to the observatory. All the astronomical software has been deployed on a brand new x3550 IBM server and a 8kVA UPS has been installed to permit emergency operations (PLC operations) in case of power failure. All astronomical components (like CCD, Focuser, Telescope, Observatory roof...) are centrally managed (or better 'orchestrated') by a commercial software called ACP. 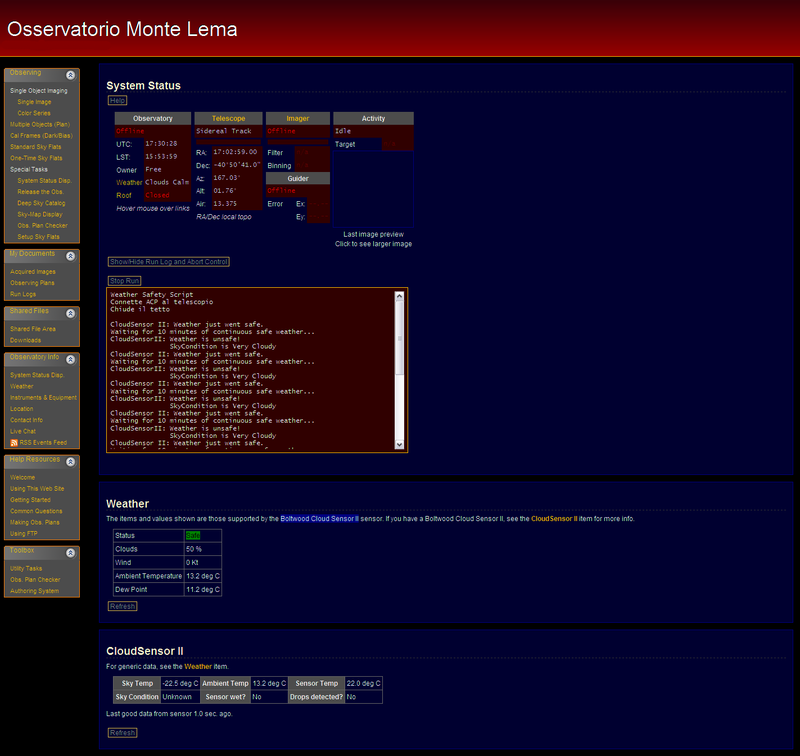 This software use ASCOM specifically written (in C#) driver to open/close the roof (via the PLC) or to move the Telescope (via LX200 protocol aka Vertigo). 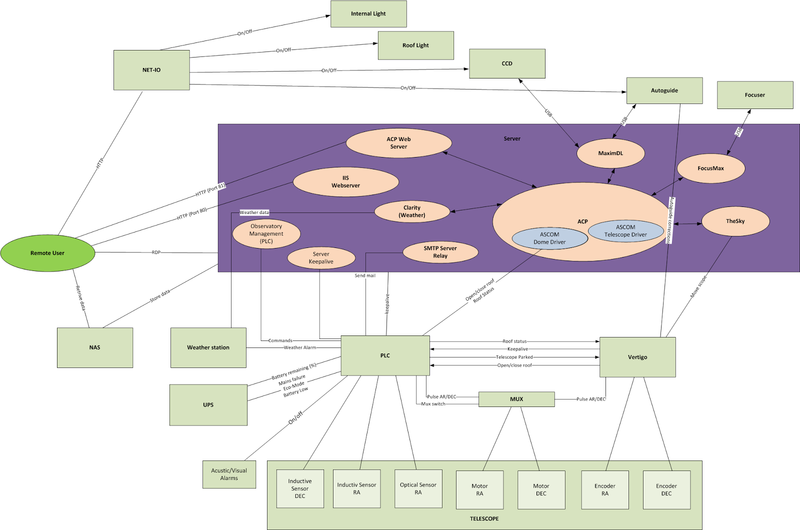 A better (but probably confusing for this post purpose) overview of the various components (software and hardware) is shown in the diagram below.